Included in the class price of $75.00 will be the Sweet ‘N Sassy™ Template and the Maddie Bea’s Quilt Pattern a combined retail value of $27.45. Light lunch will be provided. If you already have the template and pattern contact Becky for discounted price. NO REFUNDS--SUPPLY LIST WILL BE SENT AT A LATER DATE. Come join us and learn how to make this beautiful quilt using the Sweet ‘N Sassy™ Rhombus Template. P.J. describes her Sweet ‘N Sassy™ templates as the easiest way to make quilts with rhombus or diamond shapes. Sweet ‘N Sassy™ Templates let you create beautiful diamond quilts and other projects in a snap. Quilters love the no-waste style cutting and piecing that can be achieved with this unique template. P.J. Anderson is a quilt designer who has been teaching and lecturing across the United States for the past 15 years. 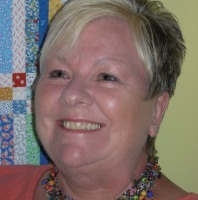 She teaches quilting for all levels—beginner to advanced—and has published numerous original quilt patterns. P.J. began working with Creative Grids® in 2001 to develop her Sweet ‘N Sassy™ Rhombus Templates. This will be the first class P.J. has taught in Tennessee!